In the fall of 2015, we took time off to reassess and re-imagine Family Field Day, an event we had hosted since 2008. We felt it might be time for something different, with the goal also of reaching a broader community in the future. The Family Field Day Committee met several times and came up with a new fall event – a Barn Party for ALS! The 2016 party will be held on Friday, November 18 from 6:00 – 10:00 pm at the Washtenaw Farm Council Grounds. There will be square dancing and a DJ, a kids’ raffle, a silent auction, a photo booth, and food and drinks. Tickets – in advance/at door: Adults $25/$30, includes one beer or wine ticket; children $15/$20. We are very excited to hold another fun event that continues to meet our goals of raising awareness and funds for ALS while bringing together community members of all ages to have fun and be active. Keep an eye out for details. We look forward to seeing you there! Come play in the park! Sports clinics, Relay Races, Bake Sale, Grilled Brats, Root Beer Floats, Great Raffle Items, Chair Massages, Face Painting. This event is fun for kids and adults of all ages – bring the whole family and have a great time! For more information, View the 2014 Family Field Day poster or contact us at [email protected]. Thank you to the die-hard Family Field Day supporters who came out in the rain on Sunday September 29th to raise funds for ALS research and raise awareness. With their energy and their smiles, we had a blast! 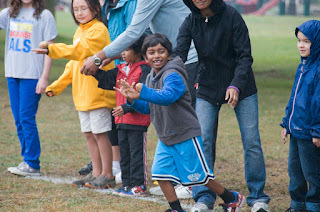 Kids didn’t mind the wet weather – they charged through relays and covered the Burns Park field playing flag football, field hockey, lacrosse, golf, soccer, basketball and pétanque. Adults enjoyed chair massages, yoga, BollyFit® dancing and World Dance. We had a fun raffle with over 40 items, and we thank Mr. Hatt (Burns Park Principal) and Emily Samuelson (Olympic Skater) for hanging out with us on a rainy afternoon and drawing our raffle winners! Take a look at the photo gallery! Who knew a rainy field day could be so much fun? Many thanks to our main sponsor, Blue Care Network of Michigan. And thank you to the generous donors who helped to make the day such a success. Please be sure to support them when you can. Click on image above to see more! We had a great time at the 5th Annual Family Field Day. This year, we had double clinic sessions so that kids could participate in two sports with our great local coaches! The fields were full of flying Frisbees, soccer balls, footballs, lacrosse balls and field hockey balls. We had some great activities for adults, including yoga and bootcamp. Calders and Morgan and York once again donated ice cream and root beer for the best root beer floats in Ann Arbor! And we had brats and dogs (both real and the veggie kind) grilling up thanks to the Martin Family. Amanda Mercer, captain of the Channel for ALS Team, was our special guest and spoke to the kids about setting goals and making a difference by helping others. She and the whole team talked about their swimming adventure at a special round table. It was a fantastic afternoon and we hope to see all of you next September. We want to thank our generous sponsors, many of whom have donated for five years in a row to our fun afternoon! Arbor Active Against ALS held the 4th Annual Family Field Day in Burns Park to raise funds for ALS (Lou Gehrig’s Disease) research. Family Field Day has something for everyone: relay races, kickball, petanque, lacrosse, field hockey, ultimate frisbee, a scavenger hunt, and sports clinics run by area coaches (field hockey, flag football, lacrosse, soccer, ultimate frisbee). This year we added Bollyfit Dancing, Pilates, chair massages and a fun raffle. Special Guest Speaker Chris Thompson, a University of Michigan graduate and 2000 Olympic Swimmer Bronze Medalist in the 1,500 meter freestyle, had a great time playing. The kids loved seeing his Olympic medal. Click image for gallery of photos! Ann Arbor Active Against ALS held a fun afternoon at the 3rd annual Family Field Day on Sunday October 17, 2010 from 1:00 – 4:00 at Burns Park. We had games and activities for children and adults of all ages including relay races, kickball, petanque, a scavenger hunt, and sports clinics run by area coaches (lacrosse, field hockey, flag football, soccer). Thank you to Phi Delta Theta for having such an awesome and fun presence at Family Field Day once again. We also had donations of brats (from the Martin family), amazing baked goods, including 10 awesome pies from Zingerman’s, root-beer (from Morgan and York) and ice cream (from Calder Dairy), pumpkins (from Farmer John Hochstetler), cider (from Busch’s), Honey Crisp apples (from Whole Foods), Ann Arbor Against ALS t-shirts and a variety of books on ALS for sale. 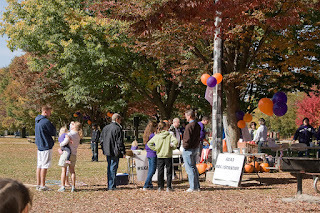 On October 18th, we held the 2nd Annual Family Field Day in Burns Park. We raised funds for research, informed people about ALS, and had a great time! Thank you to all of our sponsors and to the great folks who came out! Family Field Day on Sunday, November 2nd was a great success and kickoff this new non-profit, Ann Arbor Active Against ALS, to raise funds for ALS research! We planned for 200 participants but had almost 350, from 111 families – despite the rain at the start – and raised about $7,000! We had a lot of fun with clinics in field hockey, lacrosse, soccer, and football. Old and young kids alike played kickball, ran crazy relays, used hula hoops, jumped rope, and generally ran around when they weren’t eating great food – brats, dogs and baked goods – or drinking hot cider, hot chocolate, or root beer from a keg. We also listened to great music the whole time and watched a group of dancers from Bolly Fit led by Anuja Rajendra demonstrating wonderful and unique fitness dancing techniques. Many thanks to ALL of the instructors and volunteers for our clinics – it was a great time!